New Jersey: Liberty and prosperity. New Jersey, my adopted home state. New Jersey, crossroads of the Revolution. New Jersey, subject of "Be Nice to New Jersey Week." New Jersey's reputation is probably best described in the movie Fletch Lives. Chevy Chase's character is a newspaper reporter who has just inherited a dilapidated plantation in Louisiana. A certain someone is trying to force him off his land, and Fletch stumbles across some smelly stuff. He sends it back to his newspaper, which has it analyzed. "It's toxic waste, Fletch," says his editor. "There are only eleven places in the country that make this stuff." Cut to Fletch listening to the list of factories. "Frank, just give me the ones that aren't in New Jersey." Frank replies, "There's only one." Some things that aren't in New Jersey, in great abundance anyway, are welcome signs. I have crossed into New Jersey at at least a dozen different spots (George Washington Bridge, Holland Tunnel, Lincoln Tunnel, Goethals Bridge, Outerbridge Crossing, Delaware Memorial Bridge, Walt Whitman Bridge, Burlington-Bristol Bridge, US-1 bridge, I-78 bridge, US-22 bridge, I-80 bridge, I-287, local Mahwah/Suffern streets), and this sign, on I-95 S / I-80 W in Totowa, is the only one I could find. There's supposedly another one at the beginning of the Garden State Parkway in Cape May County. I've never been there though. There is, however, a small sign on I-78 at the Pennsylvania/New Jersey line; but that one spends more room warning you about speed limits than it does welcoming you to the Garden State. At the other end of I-78, there is a small marker stenciled into one of the gantries immediately upon exiting the Holland Tunnel, which says "Welcome to New Jersey" in six inch white letters on the maroon gantry. That's all. In my book, that doesn't count. Although the price billboards at the gas stations are a welcome sight after just coming out of Manhattan (usually about a 20� difference). Other than that, that's about it. The only large sign I've seen is the one pictured here. You will notice that the location of the sign indicated above in the legend map is not exactly on the border. That is not an error. You have to drive on I-80/95 for almost six miles before you come across it. Six miles! And at that, it says only "Welcome to New Jersey" in white on highway green. That's it. No "Garden State," no "Christine T. Whitman, Governor," no cutesy slogan. Just a little "advertisement"? for the New Jersey Turnpike, against whose toll hikes I have opined. From what I understand the aforementioned Cape May sign looks just like this, except it says "Garden State Parkway," flanked by two Parkway logos. And the pièce de resistance: You have to love the assembly: pressure-treated 2x4's. And they're not even planted in the ground; the entire assembly rests in one piece with 2x4's acting as skids. It's as if the entire sign can be picked up and whisked away on a whim. I wonder if this sign is still there. Is it? This picture was taken in November, 1999. 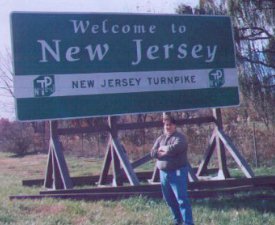 Note: There is a very large, decorative welcome sign in the center median of the Garden State Parkway at the New York state line near Upper Saddle River. It is the only other large welcome sign I have ever seen in New Jersey. Trenton is the state capital closest to where I live, about 28 miles away. It is also the first picture in this quest that I have retaken. The original picture was taken on a cloudy day where the gilded dome seemed to blend into the sky. 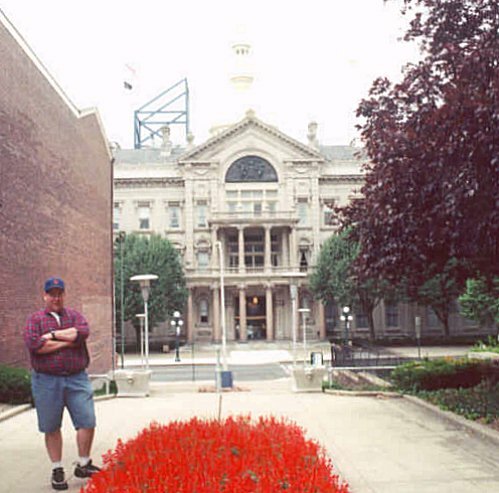 New Jersey's capitol is located on State Street, and is actually on the street, separated from the road only by the width of the sidewalk. There is no cascade of steps, no grand lawn. It's as removed from the street as a coffee shop. With that in mind, the capitol building is at least three stories, so the roof obscures the view of the dome unless you're either high enough or far back enough. So when I went back to Trenton, I looked around for another location from which I could shoot the dome at a better angle. There are no capitol grounds; the front is right on the street, the sides are flanked by other buildings (though there is a small park off to one side), and the rear faces a dilapidated parking lot. The building is very oddly shaped. There are all manner of protuberances on the roof blocking the rotunda. If you want to see the dome clearly you either have to be in a helicopter flying overhead, or in a boat a half mile away on the Delaware River. The rotunda itself is unusual as well. It has sort of a mushroom shape, with the lower tier of columns narrower than the golden dome a level above. On foot, it's not much better. I could either get a picture of the building or a picture of the dome. This page loaded in 2.557 milliseconds.